12/7 SECOND SARA SALLY SILVER CLASS Due to demand, SF is offering the chance to sign up for a repeat of Sara Sally's Silver Glass class to be held at Beads by Design on Tues Jan 25th. SF Member cost is $180. Non Member cost is $205. For more class information click here. To sign up click here or email Martha Fuerst at martha1st@comcast.net. 12/6 BOC ON TV AGAIN Sunday Morning on CBS will be show a segment on the Beads Of Courage program. It will air on Sunday, 12/12 sometime between 9:00 and 10:30 AM. It is expected to feature BOC kids, medical staff, founder, beadmakers as well as a bit about the history of beads from the Bead Museum too! 12/6 VOLUNTEERS NEEDED Beads of Courage needs a couple of volunteers to pass out beads to the kids at Scottish Rite Hospital on Tues Dec 14, 1-4 PM. Details below. If you can help out, contact Robert Simmons at rsimmons@gsu.edu. 12/6 HOME STUDIO SHOW Diane Kovach and Donna Myrick are having a Home Studio Show on Sat Dec 12 Noon-5PM. There will be Door Prizes, Snacks, Drinks and Music. Get extra tickets for bringing a friend or wearing a Christmas/Holiday Sweater, Vest or Jewelry. Email Diane@DKDesigns.biz for address and directions. 12/6 MICHAEL BARLEY CLASS The amazing Michael Barley will be teaching again for Southern Flames this Spring. More info about this class coming soon. PROF ROBERT SIMMONS REVEALED Think you know who Robert Simmons is and what he does Think again and click here to read the article that Georgia State University just published about him. 12/6 GEM & MINERAL SHOW PHOTOS Photos taken by Joan Houghton-Theall, Marcy Lamberson and Bonnie Anderson are now available in the Southern Flames Scrapbook. Click here to see them. 11/14 NEW FLAMETREE CONTEST FlameTreeGlass is having a Christmas Glass Art Contest with 5 amazing prizes - torches from GTT - a Phantom, a Scorpion, a Lynx, a Bobcat and a Cricket - the Web Mama is having palpitations just typing this! For all the details about this hard glass/soft glass competition, click here. And remember to followthe instructions for submitting photographs of your work, to the letter or they may not be posted. Good Luck!! 11/14 CHRISTMAS TREE RAFFLE And don't forget while you are at the torch to make beads to hang on our Christmas Tree - the more you make, the more raffles tickets you earn. See the December Meeting info for links to photos and additional information about the Holiday Party, Challenge & Raffle. 11/14 SF MYSTERY CHALLENGE WINNER After 3 months, we finally had a winner for the Mystery Challenge. The secret theme was a technique and the technique was FUMING! Winner of the challenge of the 3 prizes which had accumulated for Sept, Oct and Nov was Diane Kovach! 11/8 COBB GEM & MINERAL SHOW Southern Flames will have a booth at the Cobb Gem and Minerals Show on Fri, Sat, and Sun Nov 19-21 at the Cobb County Civic Center. Click here for all the details. 11/8 BEADS BY DESIGN OPEN HOUSE Beads by Design will be having an Open House as well as a Beads of Courage Day on weekend of Nov 19. Check back here or e-mail Beads by Design for additional information. NEW LARK BOOK Congratulations to Margo Knight and Marcy Lamberson who had photos accepted for a Lark Crafts Book "Creating Glass Beads". It will be published in the Spring. 10/19 BBD CLASSES OCT NOV DEC Beads by Design class schedule for October, November and December is now available. Click here to go to their website - the link to the monthly class schedules is on the left hand side of their home page. 10/19 ISGB MEMBERSHIP DRIVE Marjorie Langston, a Southern Flames Member, and also Director of ISGB Membership has announced an ISGB (International Society of Glass Beadmakers) membership drive. For more details about ISGB member benefits click here. Also, current members renewing before Jan 1,2011 will be eligible for weekly prize drawings. 10/19 SF BROCHURE A reminder that you can print a copy of the SF Brochure - just use the last button on the right hand side of this page or our home page. We want to thank Joan Houghton-Theall who did the initial work creating this trifold for us. 10/7 BOC DAY at FLAMETREE 10/9 Please stop by FlameTree Glass this Saturday, Oct 9 Noon - 6PM and make some beads for the Beads of Courage kids. Click here for details. 10/7 HALLOWEEN CONTEST Every year FlameTree Glass sponsors a Halloween glass bead/scultpure contest with the most awesome prizes. Click here for details and remember the deadline is OCT 24. 10/7 THE ALIENS ARE COMING Most of you may know that Marcy Lamberson had 2 of her beads sent into Space as part of a Beads of Courage program. These beads are back and are now touring in the U.S. but you can have a copy and support the Beads of Courage children as well. Click here for more info about buying them. This brochure was originally created by Adele Shepherd and modified by Sylvie Lansdowne to display more efficiently. The brochures will be permanently available from several places on our website (see last button on right) so that you can print a copy for prospective members or customers. 9/6 BBIRDDESIGNS Becky Sizemore has a new website. Check it out at www.bbirddesigns.webs.com and be sure to look at her new work - it is in the "About Us" section. MICROSCOPY TODAY Robert Simmons who is National Director of Bead Donations for Beads of Courage is also Dr. Robert Simmons, Ph.D. Director of the Imaging Core Laboratory at Georgia State. He has just published an article in Cambridge University Press's journal MicroscopyToday entitled X-Ray Microanalysis of Art Glass Surfaces. It examines the metallic surfaces on five glass colors and addresses the potential skin contact and inhalation hazards of each. To read the entire article and see electron microscopic surface photos and what Dr. Simmons has to say about Effetre Silver Plum, Dark Turquoise, Ivory, Rubino Oro and Kugler Gold Brown, click here and then go to Page 28. Congratulations, Robert and thank you for bringing a scientific perspective to the glass we use in our work. To register please email Becky Sizemore at rjsizemore@bellsouth.net by Fri Sept 24th. One more thing - all participants are required to assist with set up, booth duty or break down so when you email Becky let her know which one of the following shifts you will be available to help. This is a great opportunity to jump in to marketing your work so we encourage you try. However, If you don't want to sell your beads, but would like to help out at the booth, please sign up for one of the shifts! We'd love to have your assistance.! 8/25 BEAD SWAP PHOTOS Photos from the August 2010 Meeting are now available. Included are photos of bead brought back by Marie Shackelford from the Gathering as well as ones of the beads and people at the Bead Swap. Click here to see them or use the "Scrapbook" button to the right. 8/19 DEMO PALOOZA Coming in January - One and a half days of free lampwork demos for Southern Flames members. And the highlight of the event will be a demo by Sara Sally LaGrande - former president of ISGB and a lampwork/jewelry artist whose work is brilliant and motivates all of us to think outside the jewelry box. 8/19 MEMBERSHIP DRIVE In order to break even financially and not raise member dues, Southern Flames needs more members. If each of us would introduce one person to the group and encourage them to join us, our events and meetings would be even more exciting. 8/19 SIZEMORE AT FRABEL Becky Sizemore has had some of her lampwork jewelry accepted for a show at Frabel. As soon as we get all the details, we will post them here. Frabel is huge in the glass world so this is a real accomplishment. Congratulations, Becky! 8/19 HOT SPOTS AT FLAMETREE Marcy Lamberson is teaching two classes at FlameTree glass - one in August on Acorns and Autumn Leaves and another in October on Owls, Monsters and Ghouls. Sylvie Lansdowne will also be teaching at Flametree in October - a hot spot focused on using Pixie Dust. Click her for details and dates. 8/19 BBD SEPT CLASSES Beads by Design class schedule for September is now available. Click here to go to their website - the link to the September schedule is on n the left hand side. 8/15 BUTTERFLY & FISH MURRINE Stephanie White now has some of her meticulously made and very reasonably priced butterfly and murrini available for sale. Click here to see them. 8/15 COBB GEM & MINERAL SHOW Southern Flames will have two tables of members’ beads for sale at the Cobb Gem and Minerals Show in Marietta, GA November 19 – 21. Southern Flames members who are interested in participating need to email Co-President, Becky Sizemore, at rjsizemore@bellsouth.net. More details to follow. This is a well know and well respected show. 8/15 SALVADOR DALI The High Museum is having a special exhibit of Salvador Dali's paintings. And of even more interest, Marcy Lamberson's Salvador Dali bobblehead piece is headed to Japan's Kobe's Lampwork Glass Museum as part of the ISGB' traveling Perspectives bead exhibit. 8/11 PLACE SETTING BEST OF SHOW The Southern Flames place setting won the "Best of Show" award at the ISGB Gathering. The plaque was presented between seminars at the Gathering to our co/president Sylvie Landsdowne. Winners also in our group were Marcy Lamberson for "Blossom and Baby" opossum at 2nd place and Stephanie White for her Butterfly bead at 3rd place. Thanks to Gerry White for initiating and organizing our winning entry. If you weren't at the Gathering and haven't seen the place setting, click here. 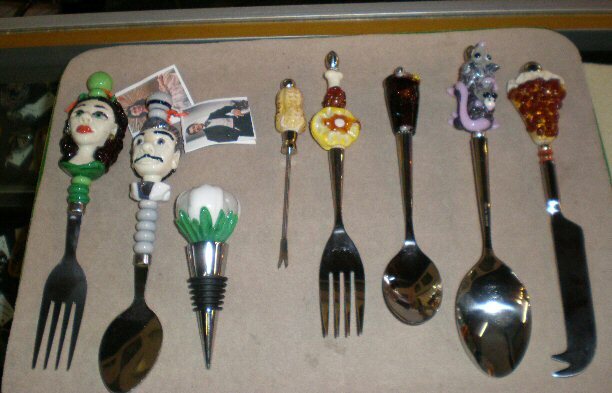 There are more photos of the place setting in our Scrapbook - July 2010 Meeting. 8/11 PMC CORES FOR GLASS BEADS There are a couple of openings in the Thurs-Fri Sept 9-10 Barbara Barbara Becker Simon class - PMC cores for Glass Beads. Price is $300 for Members; $325 for non-Members and checks and registration forms should be sent to Suzanne Patterson - her address is on the registration form. Click here for class info and registration form. 8/11 AUTUMN & ACORNS at FLAMETREE Marcy Lamberson is teaching a workshop at FlameTree Glass on Saturday August 21 12-4 PM $75.00 ca;;. Learn how to make sculptural acorn, pinecone and leaf beads and pendants working off mandrel and using bead presses. For more information, click here On September 29th Marcy will be teaching another workshop Owls, Monsters and Ghouls. 8/2 NEW SF GREETER Robin Snuttjer has agreed to server as the new SF Meeting Greeter. She will welcome visitors and new members and make sure old members receive and return their name badges. Click here see a photo of Robin in the Board Member photo section. Thank you Robin. 8/2 BOC CHALLENGE WINNER The Bead Challenge for the July Meeting was to make and bring the most beads for donation to Beads of Courage. The winner was Stephanie White, who made 86 beads! BOC AWARD & LETTER From SF Treasurer Martha Fuerst: "Southern Flames received in the mail a lovely letter and beautifully painted tile award from Jean M. Baruch, RN, BSN, Executive Director and Founder of Beads of Courage, Inc., in Tuscon. ... Ms. Baruch thanks members of Southern Flames for its very generous donation of $1,250 to Beads of Courage" and writes:"
Your donation of $1,250.00 will be used to host a Celebration of Courage Event for the children and teens who are members of the Beads of Courage Program at Children's Healthcare of Atlanta. This event will take place on October 14th and 15th on both campuses of CHOA. We will be sure to tell you the location of the event, and we hope for the support of the Southern Flames to make DREAM BEADS for the participating children. We are very excited for this event as it will provide the opportunity for member artists to meet the children and families who benefit from your generosity all year log. You are all encouraged to attend this great day to Celebrate Courage of the children we support." "Along with the letter and award is a clear heart bead with silver center, and a silver charm with the word "courage"
8/2 HEART PRESS Just added to Tips and Techniques are Andrea Winkler's instructions for using a Zoozii's press to make a heart bead for the BOC kids. These are the written instructions that she distributed during her demo and they apply to all presses. Click here to read the instructions and if you want to see photos from her demo, this is the link. 7/31 2010 POSTCARD The 2010 Southern Flames Postcard is now posted on our Home Page. You can still see postcards from previous years by clicking on the link Postcards from Past Years. Also the Member Gallery has been updated with the beads from 2010 postcard for those members who requested it. Click here to go to the Member Gallery or use the button on the right of this window. 7/24 JULY MEETING Photos now available in the SF Scrapbook. Includes Purple Heart joint demo by Andrea Winkler and Sylvie Lansdowne as well as photos of member jewelry and the BOC presentation by Robert Simmons. Click here to see them. There are 71 hospitals and 10,000 kids that participate in the program. The average BOC kid collects 500 - 800 beads during their course of treatment and most can tell you the reason for each bead on their string. Atlanta has the biggest program (most children enrolled) of any city in theUS. 7/24 BRIAN RENOUD Fred Fuerst just sent us some photos from Brian Renoud's June Demo of a fish made from Borosilicate Tubing. Click here to view them. The fish is so graceful that it makes a soft glass worker want to switch immediately to hard glass. 7/21 VOTE FOR BOC PEPSI GRANT Beads of Courage is a strong contender for a $25,000 grant from Pepsi. To win the grant, the organization has to be one of the top ten vote getters of those vying for the prize. Currently BOC is in the top 20. The children need each of us to vote every day. It only takes a minute and you only have to register the first time you go to the site. This is the link http://refresheverything.com/beadsofcourage. (If you need detailed instructions or help, click here). 7/20 SIMON CLASS OPENINGS Some openings remain in Barbara Becker Simon's September classes. Barbara is a nationally known beadmaker and PMC artist. Southern Flames members who have not yet registered for this class are urged to do so ASAP before the class is announced to the public. Click here for info and forms. 7/9 SF LIBRARIAN CHANGE We are sorry to announce that Karen Barefield who has been our Resource Cabinet Librarian is retiring from the position. Karen has done a wonderful job of keeping the contents of the cabinet organized and safe. Before Karen leaves she is going to assist Nancy Stone to assume the position. Nancy has served as warm and welcoming SF Official Greeter for the past year and we are really lucky that she is willing to take on this new responsibility. BEADS BY DESIGN CLASSES The July and August class schedules for Beads by Design Classes are available. In addition to beading classes, BBD offers classes in wire wrapping, kumihimo, metal/silversmithing, Macrame and silver clay. Click here to go to the BBD website - links to their monthly schedules are on the left hand side. Thanks to Suzanne Patterson, our new Event Coordinator for working out all the details for this class. 6/18 SILENT AUCTION FINANCIAL REPORT At the June Meeting, SF Treasurer Martha Fuerst announced that "Our Silent Auction on May 15, 2010, brought in a total of $4,537. We donated $1,250 to Beads of Courage. Expenses for the Silent Auction included $138 (8% of credit card charges) to the Atlanta Glass Art Guild for processing of these charges. Refreshments were $163. Net proceeds were $2,986." Is that not amazing!!! Thanks so much to Kristy Nijenkamp, Marcy Lamberson Suzanne Patterson, Martha Fuerst and all SF Members who assisted them in this effort. And please support the vendors who contributed to the event. Photos of their contributions and their contact information is available permanently by selecting the Silent Auction Donors button on the right. 6/17 ISGB ELECTIONS Congratulations to three Southern Flames members/supporters on their election to the ISGB Board. Gerry White has been reelected as the Southeast Regional Director; Marjorie Langston is ISGB's new Director of Membership and Terry Hale is President-Elect. Our chapter is really well represented! Create whimsical, sculptural glass beads while exploring creativity, heat control techniques, surface decoration, and more. Learn how to translate two- and three-dimensional ideas/designs into glass. Plan on have lots of fun, too! Play in the leaves and learn to make off mandrel soft glass leaf pendants, stylized pinecone beads and acorns AND easy pendant loops. Boo! Spooky, but cute sculptural owls, monsters and ghost beads will get you set for Halloween, or just any fun time. 6/13 LOREN STUMP DEMO Loren Stump gave a wonderful demo at FlameTree beads on May 23rd in which he made a bead that would be cold-worked into a Chevron bead.. Andrew Lunde took some great still photos and we are now able to link to these from our SF scrapbook. There are two albums and you can click here to access the links. Loren did not have time to anneal the bead and cold work it that evening so he gave the bead to Maureen McRorie. She did the cold work and sent us this photo of the finished chevron beads. 6/12 MEET AKIHIRO OKAMA Japanese Beadmaker Akihiro Okama will be teaching a Borosilicate class at FlameTree Glass on June 17 & 18. Maureen McRory, SF member and co-owner of Flametree Glass will be bringing him to our Southern Flames Meeting on Wed, June 16 so that we can meet him. If you are interested in learning more about his class or seeing some of his beautiful beads click here. 6/7 REMEMBERING SARA KAY HOYT Click here to see photos of Sara, her cats Boo and Buffy, and of her elegant beads. And please if you have other photos or memories or tributes to Sara that you would like to add to this page please send them to the Web Mama. The family has requested that in lieu of flowers, donations be sent to your local Humane Society in her honor. Condolences can be sent to Sara's mother, Judy Hoyt, 235 West North Street, Greenfield, IN 46140. There is also a funeral home handling arrangements.... http://www.facebook.com/l/465b3;www.Roswellfuneralhome.com ...where you can leave a message to be shared by all friends and family....guest book. 6/3 SF CALENDAR The Board has put together a calendar of meeting dates for the rest 2010 and thru May 2011. Click here to see it or use the "Calendar" button on the right. We hope it will assist you in planning your own schedules. Please keep in mind that the dates and planned events are tentative and may be changed because of scheduling issues but we will let you know of any changes well in advance Note that general membership meetings will alternate between Saturdays and Wednesdays in order to accommodate as many members as possible. 6/1 MORE SILENT AUCTION PHOTOS Check out the new photos from the auction taken by the Web Mama and Marcy Lamberson. 5/18 AUCTION PHOTOS The first photos from our fabulous Silent Auction are available. Andrew Lunde posted them in an online photo album. Click here for a link to the album. Thank you Andrew! 5/18 BOC IN ALABAMA Robert Simmons forwarded this story from the Huntsville Times about 6 year old Victoria Cumbrow and the BOC necklace that circles her neck three times. Click here to read it and to see Victoria's adorable smiling photo. 5/18 GREETINGS We are so happy that Nancy Stone has agreed to serve for another year as our SF Greeter. She does a wonderful job of welcoming both members and visitors to our meetings. At future meetings she will also have a basket for collecting Beads of Courage bead donations. Thank you so much Nancy!. 5/12 STEP BY STEP JEWELRY "SF Member Mallory Hoffman, who hails from North Mankato, MN, is published in the June-July 2010 issue of "Step by Step Wire Jewelry". On page 64 is a full page "5 Minute Jewelry" showing her art glass focal butterfly bead on an "easy wire bail" that Mallory designed." If you would like to see a photo of Mallory's butterfly bail, click here and then scroll down the page. And thank you Martha Fuerst for letting us know about this accomplishment of one our members. 5/5 POSTCARD BEADS 5/15 If you would like to have a bead on the 2010 SF Gathering Postcard it must be to Fred Fuerst by May 15th. He will be collecting them at the May Meeting/Auction. Please include with your bead the Submission form which was sent to all members by email. 5/5 MAY 15 SILENT AUCTION More photos added - Japanese Torch, Bullseye Glass, Murrini, Beads by Tink Martin and Dustin Tabor and much, much more. 4/28 MAY 15 SILENT AUCTION More photos added - Silver glass from Mountain Arts, Torches from GTT, Demo by Sylvie Lansdowne, Beads by Margo Knight and Becky Sizemore and more. You must check them out - this auction will be amazing. Thank you Kristy Nijenkamp for all the work you have done to collect these amazing items. 4/23 BUTTERFLY MURRINE PHOTOS Check out the Scrapbook to see photos from our April meeting of Stephanie White's wonderful Butterfly Wing Murrini demo and of our demo photographers! Thank you Stephanie, Fred Fuerst and Andrew Lunde. 4/19 2010 SF BOARD ELECTED Congratulations to the 2010 Board who were elected at the April Meeting and will begin their terms on May 1. New Board members include Sylvie Lansdowne (co-pres); Diane Kovach (vice pres); Stephanie White (meeting coordinator). Returning Board Members include Becky Sizemore; Martha Fuerst (treasurer); Maureen Lovell (secretary); Suzanne Patterson (Event Coordinator). And farewell and thanks to our exiting 2009 Board Members Andrew Lunde, Margo Knight and Cristie Prince. 4/19 AUCTION PHOTOS ADDED See the Oxygen Concentrator from Oxygen Plus Medical Systems, 72 rods of CIM glass from Frantz, lots of beads from SF members, 2 Lampworking Books and much more. Click here to see all the photos - new ones on top of each page. 4/19 2010 SF POSTCARD DEADLINE Fred Fuerst has volunteered to put together our 2010 SF Postcard for the Gathering - Because time is tight - if you want your bead on the postcard - it must be to Fred by the May 15 meeting. Thank you, Fred! 4/19 LOREN STUMP at FLAMETREE Flametree Glass has agreed to host a demo by one of the greatest beadmakers in the US - Loren Stump. The Demo will be on Sunday, May 23rd at 7-9 PM. Go to the FlameTree website for address and directions. 4/14 2010-2011 SF Dues A Reminder hat Southern Flames Dues for the next year will be due on May 1. You can give Martha Fuest a check or pay by PayPal. For details click the 4th button the right - the one that says "Pay Dues". 4/14 CONVERGENCE CONGRATULATIONS Three necklaces from Southern Flames members have been accepted into the ISGB Covergence Exhibit. Congratulations to Stephanie and Gerry White, Marcy Lamberson, and Camille and Robert Simmons. We can't wait to see them. 4/14 MAUREEN LOVELL Maureen Lovell's work has been accepted for sale by a gallery/gift shop in Blue Ridge. As soon as she sends us detail we will post them in case you are in the area. Way to go Maureen. 4/14 MORE AUCTION PHOTOS More photos of auction items have just been posted - glass, a class, books and more. Click here to see them. 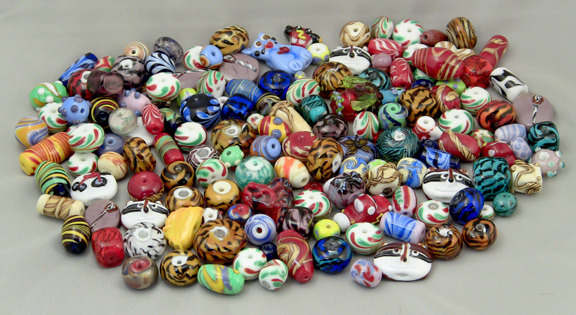 4/14 BBD BEAD SALE Beads by Design is having a sale on all fire polished beads through April 16 - 30% off. BEADS OF COURAGE IN SPACE CONTEST: The initial deadline for this ISGB competition was 4/12 but more details and the remaining deadlines are available if you click here. 4/2 SILENT AUCTION PHOTOS Kristy Nijenkamp and Marcy Lamberson are working hard to collect items for the Silent Auction and just sent us photos of some of them. Click here to see some of what we will be auctioning off and check back as we will add new photos. AND MARK MAY 15 on your calendar - this is a SF event, not to be missed by you and your friends, family and colleagues. 3/31 MARCH MEETING PHOTOS Check out the Southern Flames Scrapbook or click here to see photos from Janelle Zorko's demo at our March meeting. Thanks once again to Fred Fuerst for taking these pictures so that those of us who could not be at the meeting can see what Janelle did. 3/26 PIGGY TUTORIAL There is currently a request for pig beads by the children in the Beads of Courage Program. Marcy Lamberson has written a tutorial for making one. Click here to see it and it will also be listed permanently in our Tips and Techniques section. 3/26 BBD CLASSES APRIL & MAY The April and May class schedules for Beads by Design is available. In addition to beading classes, BBD offers classes in glass beadmaking, beaded kumihimo, soldering and wire wrapping. Click here to go to their website - links to their monthly schedules are on the left hand side. And there are photos of almost all the class projects. 3/25 BOC IN SPACE How would you like one of your beady creations to take a ride on the Space Shuttle? We’re not kidding! As part of TEAM Beads of Courage we send handmade beads on special journeys and when they return they’re presented to Beads of Courage kids. NASA is joining TEAM Beads of Courage and will be taking some TEAM Beads of Courage for a ride into outer space with astronauts on the next shuttle launch! Click here for details! 3/25 ISGB SCHOLARSHIP The winner of the Southern Flames ISGB Gathering Scholarship is Marie Shackelford. Congratulations Marie! 3/5 PHOTOS CAITLIN HYDE Check out the SF Scrapbook for lots of new photos of Caitlin Hyde's demo, class and beads. We are lucky to have not only the photos that the Web Mama took but a great series of ones from the demo that were made by Fred Fuest - they are his best ever. In addition, Joan Houghton Theall who was a member of the Sat/Sun class, contributed some great photos of that. Use the SF Flames button on the right or click here to see them. 3/5 LILLIE WINS DOORPRIZE The February door prize of glass from FlameTree was won by Lillie Baverdam. This month a donation of a bead to Beads of Courage was required to partipate and since Lillie has donated thousands of beads (literally) to the children we are all excited that she won. 3/1 FLAMETREE CLASSES FlameTree Glass has some fabulous classes this spring including ones by Lawrence Stump, Emilio Santini, Akihiro Okama (Borosilicate) and Jari Sheese who makes fabulous hollow beads. Go to FlameTree's Website www.flametreeglass.com page through their Workshop pages for details on these classes and the many others offered. 3/1 MARGO KNIGHT at SPRUILL Each quarter, Margo Knight offers introductory and intermediate classes and workshops at Spruill Center in Dunwoody. In addition, many experienced Southern Flames beadmakers have spent their Saturdays working with Margo over the years. They keep going back because they learn so much from Margo and from each other. For more details about the classes Margo is teaching, click here. 3/1 LAMBERSON on MOERTEL Make sure you check out the winter issue of ISGB's The Bead. Marcy Lamberson has, as usual, done a wonderful job showcasing the work of a German beadmaker - in this case Melanie Mortel. Melanie's work is whimsical, delightful and interesting. 3/1 BOC and THE BEAD Also in the winter edition of the ISGB Magazine is an article by Jim Kervin on Butterfly beads and there are photos of butterfly beads by Robert Simmons and Marcy Lamberson. In addition, Robert's tutorial on making his butterfly beads is featured with lots of photos. 2/13 DOOR PRIZE FOR BOC DONATIONS We will have a door prize drawing at our February meeting. The prize is FAB - a $25.00 gift certificate to FlameTree Glass. To be eligible you must bring one or more beads to donate to the Beads of Courage kids. 2/13 CAMPBELL FOLK SCHOOL Marjorie Langston will be teaching two lampworking classes at the John C. Campbell Folk School in NC. Click here to find out more about the Folk School and the classes Marjorie is teaching. It is an exciting place to visit and learn. Please be sure to include your contact information with any donations so BOC can send you a receipt. 2/1 DON MEADOW'S DEMO PHOTOS AND VIDEO!!!! Not only do we have lots great photos of Don Meadows horse head bead demo taken by Fred Fuerst but we also have a 5 part video which was photographed and then edited to work on UTube by Andrew Lunde. It is fabulous to have of all of this available to us. Click here to go to the Scrapbook for links or use the SF Scrapbook button on the right. Thank you Fred and Andrew. 1/17 SILENT AUCTION Marcy Lamberson and Kristy Nijenkamp who are putting together a SF Silent Auction in the Spring need someone to help Suzanne Patterson with publicity. Email Marcy (lambo@mindspring.com) or Kristy (nijenkamp@bellsouth.net) or Suzanne (sspatt@mindspring.com) if you can help out. They are having two special presentations that afternoon by Jeff Baker and Amy Ferber on Innovative Use of Glass in Architecture and Interior Design. Jeffrey Baker is a local Atlanta Architect and Interior Designer whose background prior to moving into the field of architecture is in theater and lighting design. Jeffrey has practiced in Georgia as a Staff Architect and Interior Director with the Hunter Group Architects and as a Staff Architect and Project Manager with Smallwood, Reynolds, Stewart and Associates prior to establishing his own firm , Jeffrey Bruce Baker Designs,,LLC. His firm focuses on the environmentally responsible residential design, interiors, and commercial planning and design. You can see some of Jeffrey’s work at www.jbbakerportfolio.com. Amy Ferber will share a SLIDE PRESENTATION which covers a brief history of Bullseye Glass Co. and then takes us on a visual tour of the Bullseye Factory. Amy has worked at Bullseye Glass for four years in the Sales department. She has worked with dealers, artists and students as well as represented Bullseye at conferences , trade shows and dealer events. As part of her ongoing product training she has taken a variety of kiln glass classes. BUTTERFLY BEADS for BOC Beads of Courage is in need of about 20-25 Butterfly beads. These beads are the ones given to the family of a child who has lost their battle with their disease. For further information, contact Robert Simmons at rbsimmons@mindspring.com. 1/7 SF CALENDAR Did you know that you can see tentative dates for future SF meetings. Click on Calender - it is the 6th button on the right. 1/7 BEADS BY DESIGN CLASSES The January, February and March class schedules for Beads by Design Classes is available. In addition to beading classes, BBD offers classes in wire wrapping, kumihimo, metal/silver smithing and silver clay. Click here to go to their website - links to their monthly schedules are on the left hand side. 1/7 HOLIDAY PARTY PHOTOS Check the Scrapbook or click here to see photos from the December Meeting and Party and of the Holiday Tree. 1/7 THANK YOU from ROBERT SIMMONS Robert writes "Here's a big Thank You to everyone who helped get the nursing staff beads ready for the holidays. We ended up with 168 staff beads which I will deliver to Nancy Campbell (at Egelston) tonight. She'll be sure that all of the BoC caregivers get s special holiday bead from Southern Flames." 1/7 BOC BEADATHON Robert Simmons also reports that 169 beads were made during the November 2009 Bead- a-Thon held at Beads by Design. Click here to see them.